With summer weather finally here, I’ve been craving fresh fruits and cold beverages, making smoothies my go-to breafast choice. Looking for a good recipe, I stumbled accross this post we did three years back. The Banana Berry smoothie was so delicious! I added a bit of vanilla extract just for some extra flavor and included cherries since they were in my bag of frozen fruit. Take a break from the heat and blend up one of these nutritoius, filling, and thirst-quenching smoothies this weekend! ESPN called us last week regarding a question they got from a reader who doesn’t like to eat a ‘big breakfast’ in the morning but needs something that can last her till lunch. Our own Sarah Butler MS, RD answered the call with a few simple suggestions, one being the every so easy smoothie! If you don’t like or have greek yogurt around, plain nonfat regular yogurt is a great substitute! Do you have any favorite smoothie combinations? 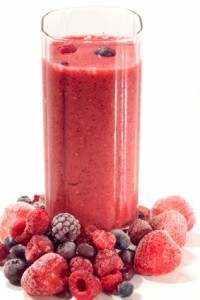 I just tried the mixed berry smoothie and it was amazingly delicious. Thanks for posting that recipe!